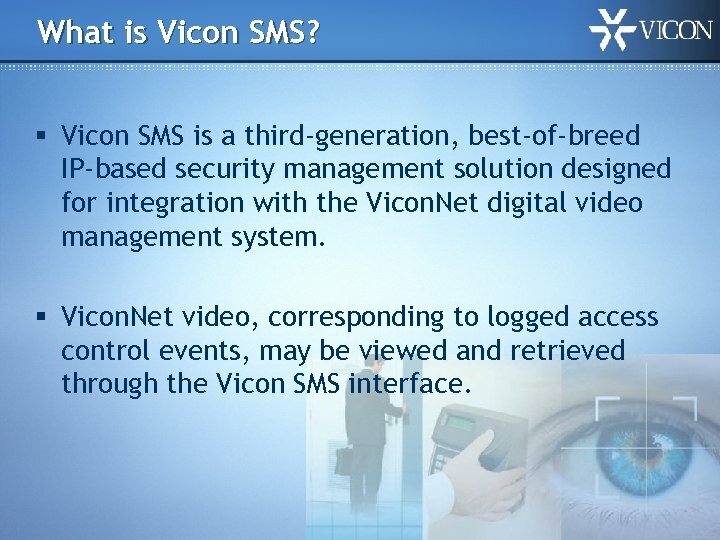 What is Vicon SMS? 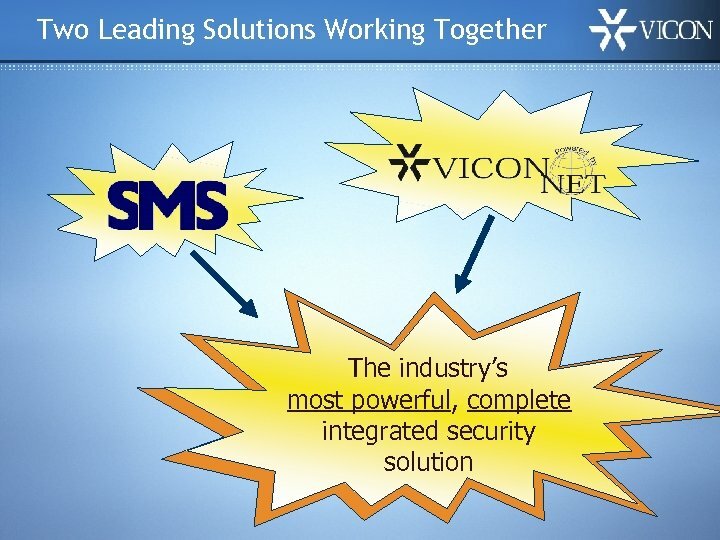 § Vicon SMS is a third-generation, best-of-breed IP-based security management solution designed for integration with the Vicon. 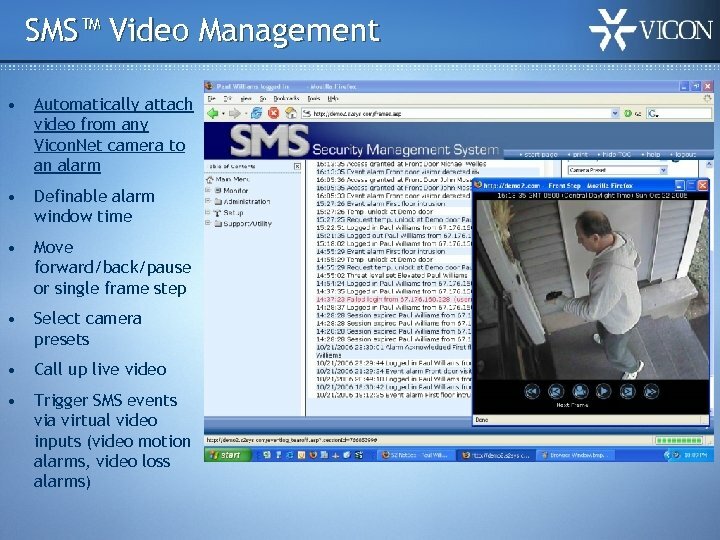 Net digital video management system. § Vicon. 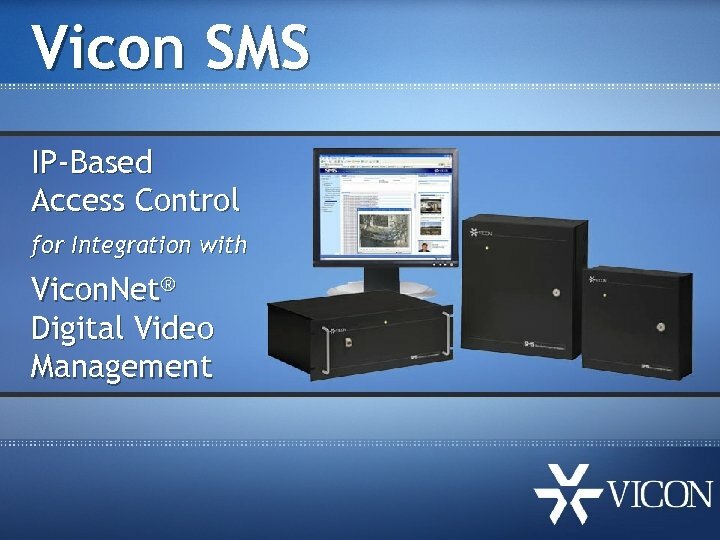 Net video, corresponding to logged access control events, may be viewed and retrieved through the Vicon SMS interface. 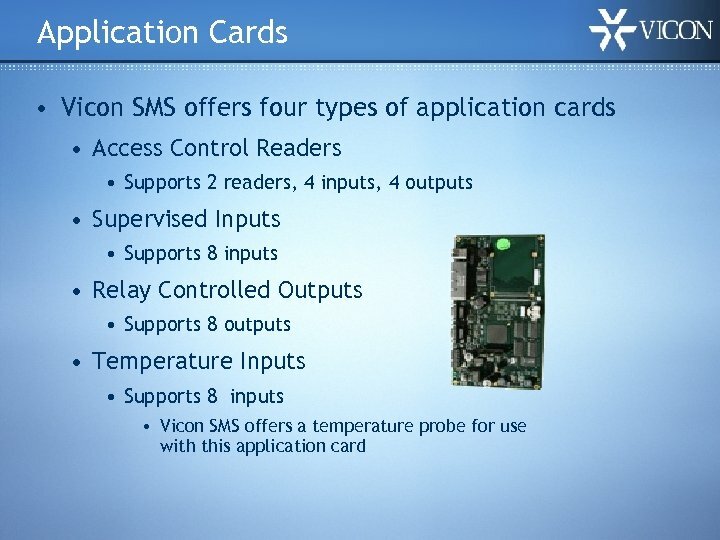 Why Vicon SMS? 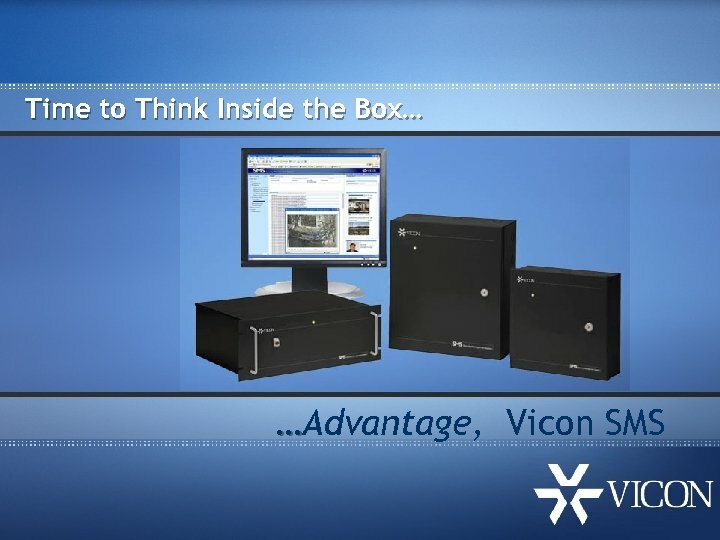 § User-friendly Vicon. 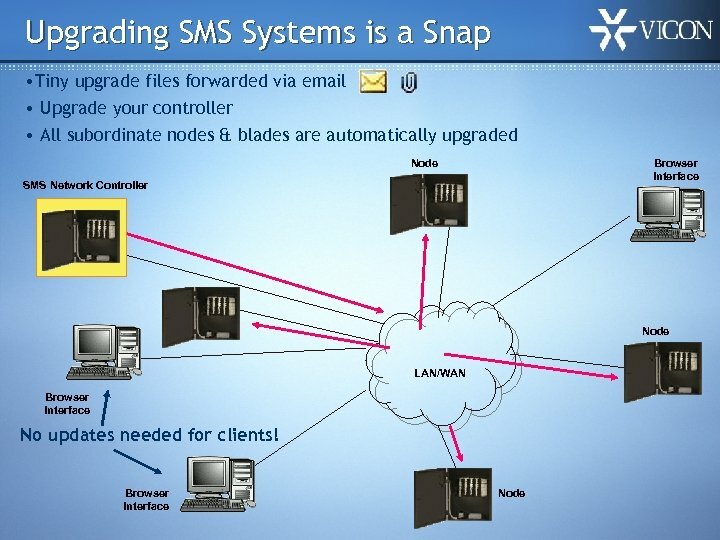 Net SMS software runs exclusively on a combination of network edge appliances and devices that require no PC-based server. 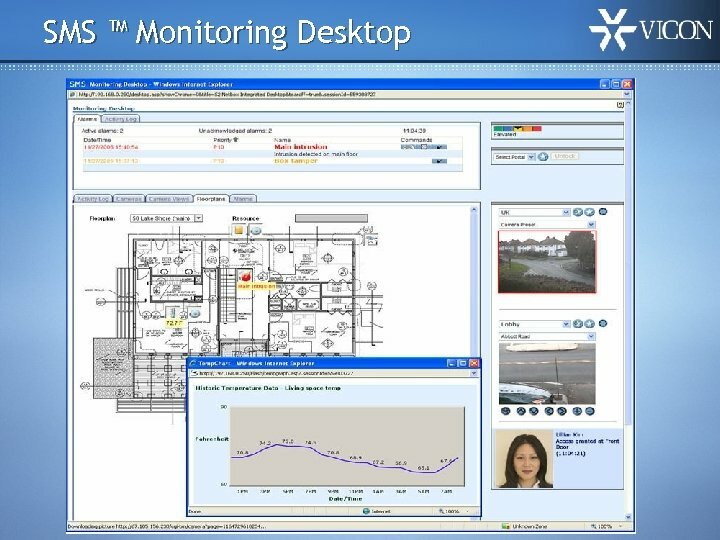 § The browser-based interface allows control of the system from any browser-enabled PC with access to the network. 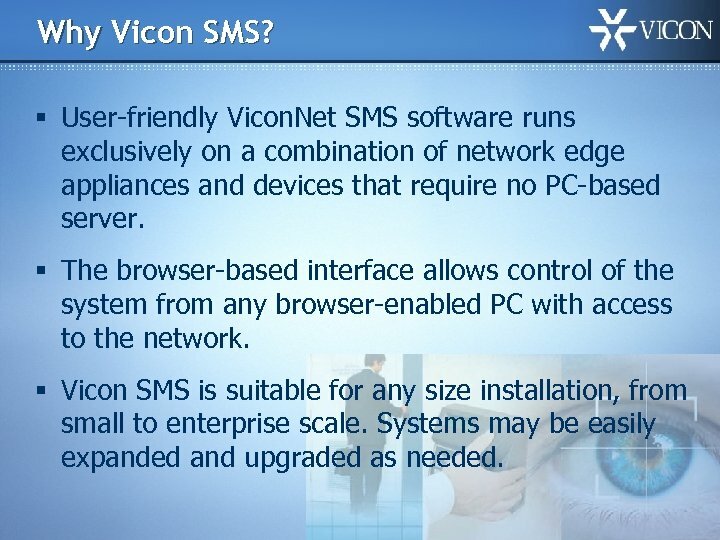 § Vicon SMS is suitable for any size installation, from small to enterprise scale. 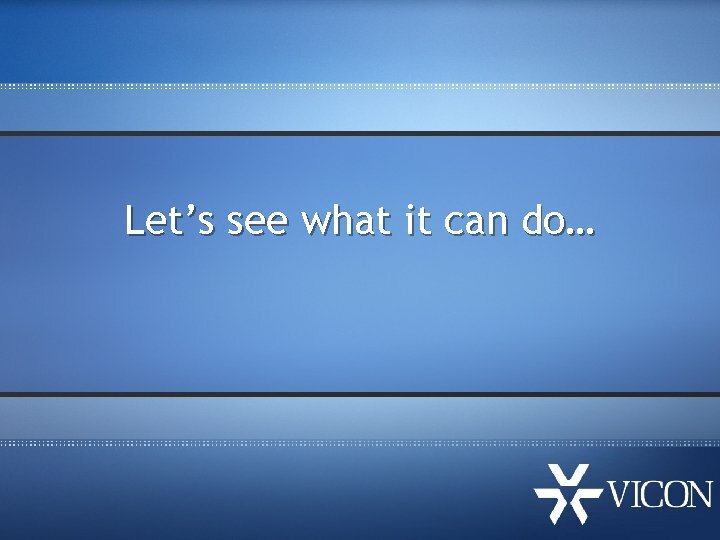 Systems may be easily expanded and upgraded as needed. What Does 3 rd Generation Mean? 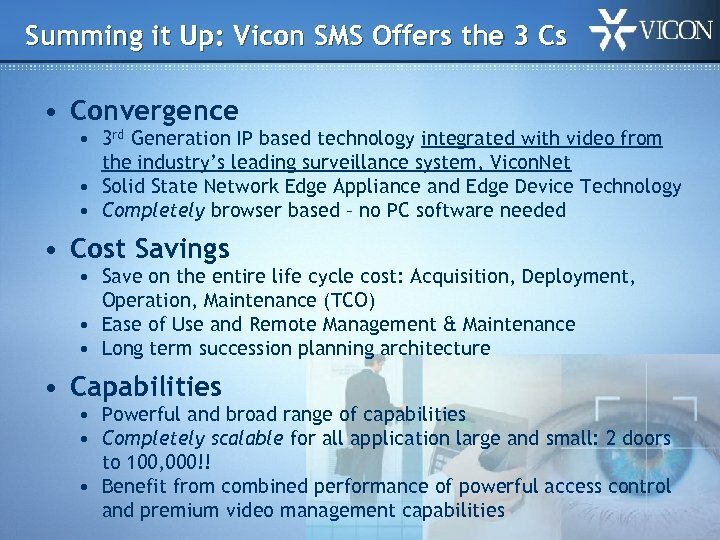 3 rd Generation – 2004 & beyond Network edge appliances, edge devices, zero footprint software, no PC based server required – Vicon SMS! 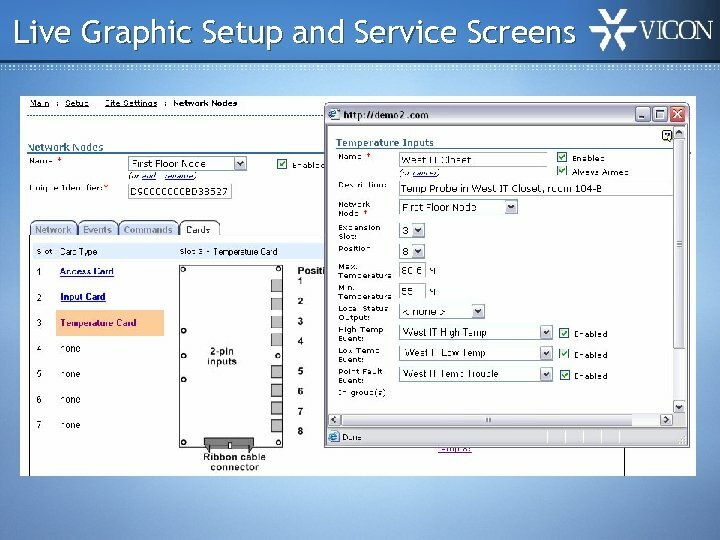 2 nd Generation - 1990 s Windows-based PCs, client/server environment, typical of most current product offerings (Lenel, GE, Honeywell, etc. ) 1 st Generation - 1980 s Host based systems using VAX or Unix and “dumb” video terminals. 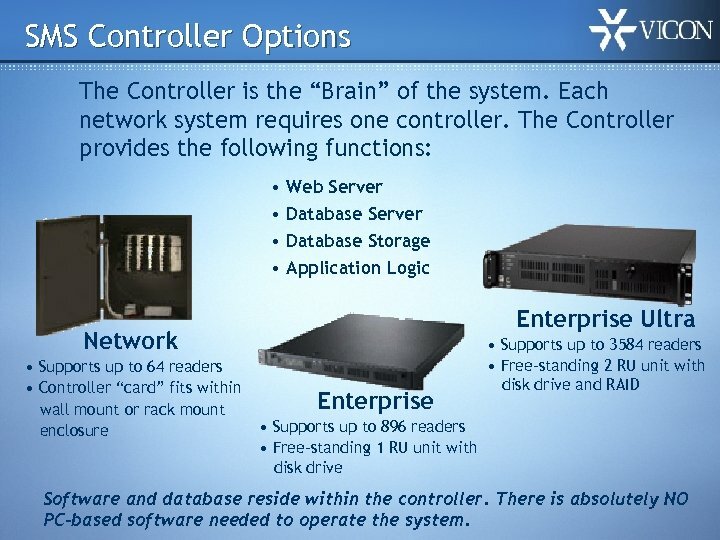 SMS Controller Options The Controller is the “Brain” of the system. 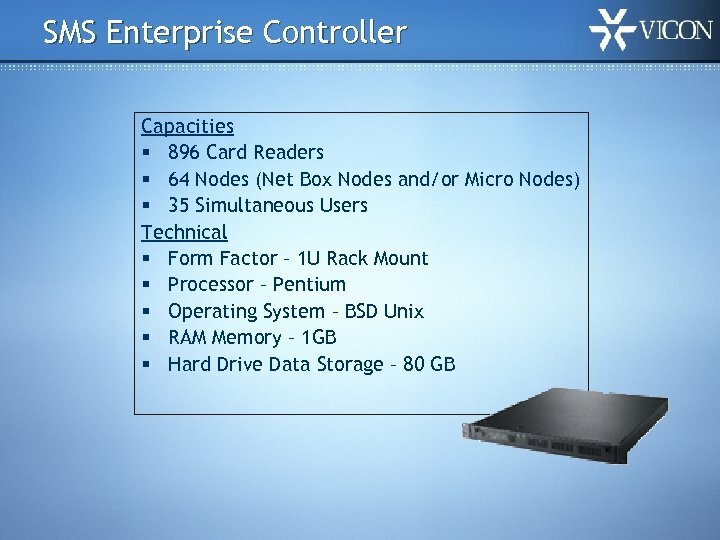 Each network system requires one controller. 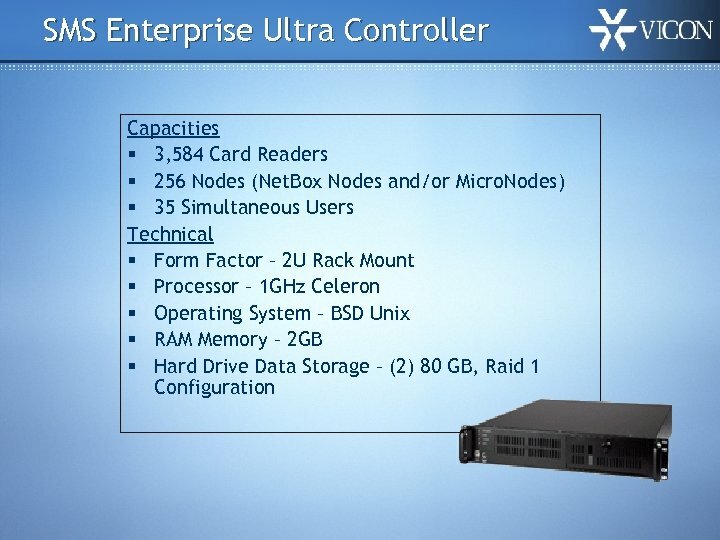 The Controller provides the following functions: • Web Server • Database Storage • Application Logic Enterprise Ultra Network • Supports up to 64 readers • Controller “card” fits within wall mount or rack mount enclosure Enterprise • Supports up to 3584 readers • Free-standing 2 RU unit with disk drive and RAID • Supports up to 896 readers • Free-standing 1 RU unit with disk drive Software and database reside within the controller. 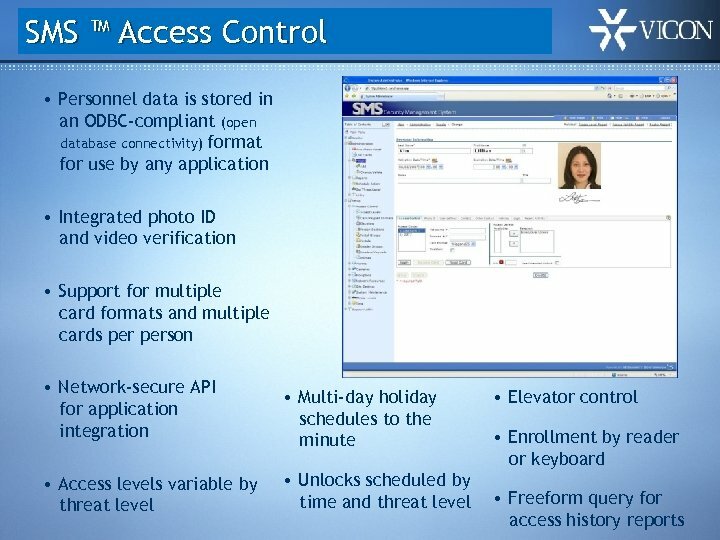 There is absolutely NO PC-based software needed to operate the system. 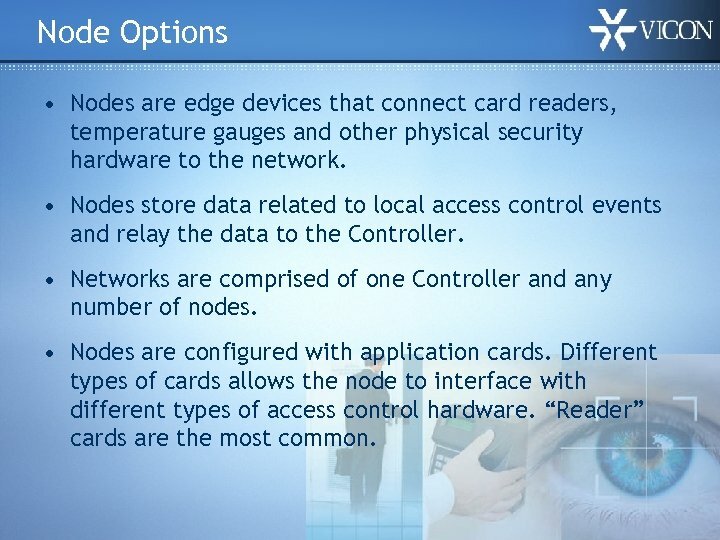 Node Options • Nodes are edge devices that connect card readers, temperature gauges and other physical security hardware to the network. 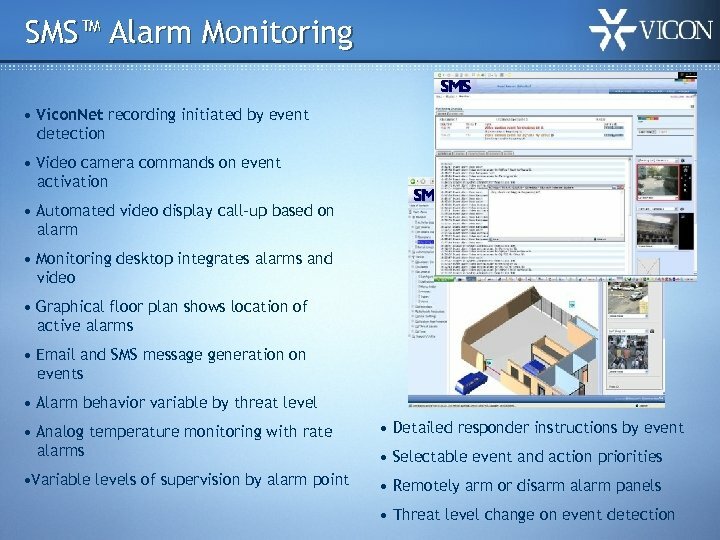 • Nodes store data related to local access control events and relay the data to the Controller. 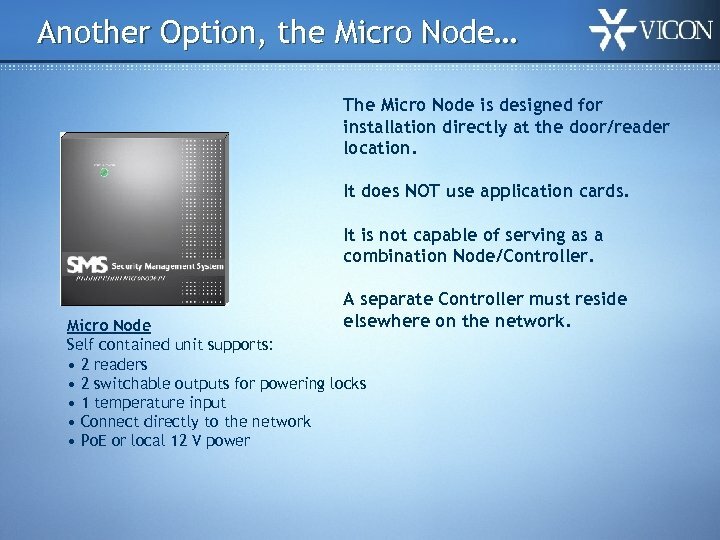 • Networks are comprised of one Controller and any number of nodes. 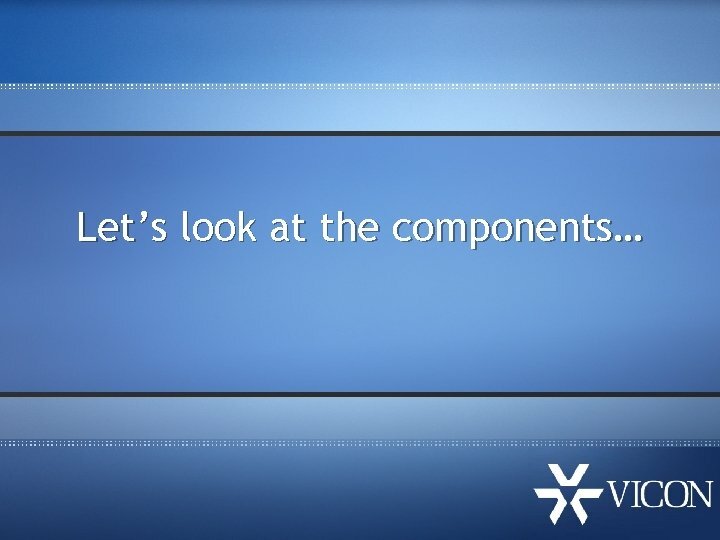 • Nodes are configured with application cards. 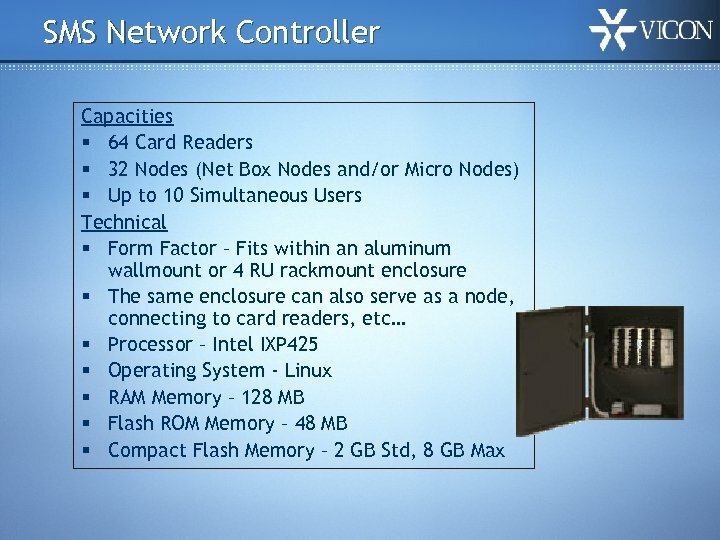 Different types of cards allows the node to interface with different types of access control hardware. “Reader” cards are the most common. 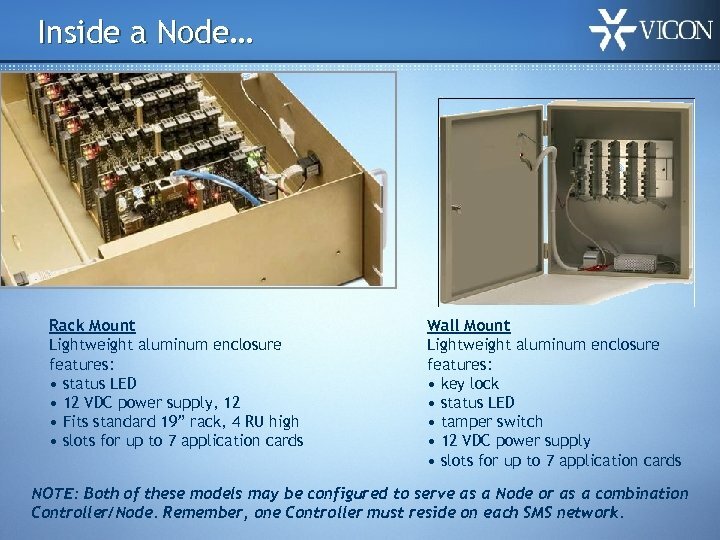 Inside a Node… Rack Mount Lightweight aluminum enclosure features: • status LED • 12 VDC power supply, 12 • Fits standard 19” rack, 4 RU high • slots for up to 7 application cards Wall Mount Lightweight aluminum enclosure features: • key lock • status LED • tamper switch • 12 VDC power supply • slots for up to 7 application cards NOTE: Both of these models may be configured to serve as a Node or as a combination Controller/Node. 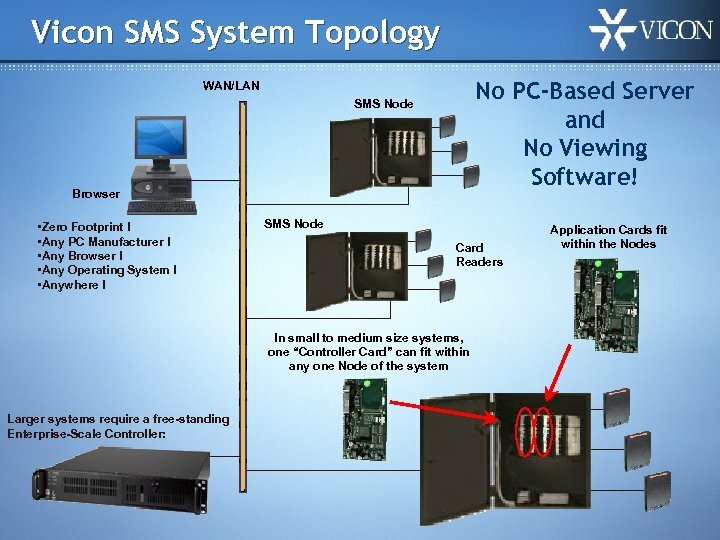 Remember, one Controller must reside on each SMS network.